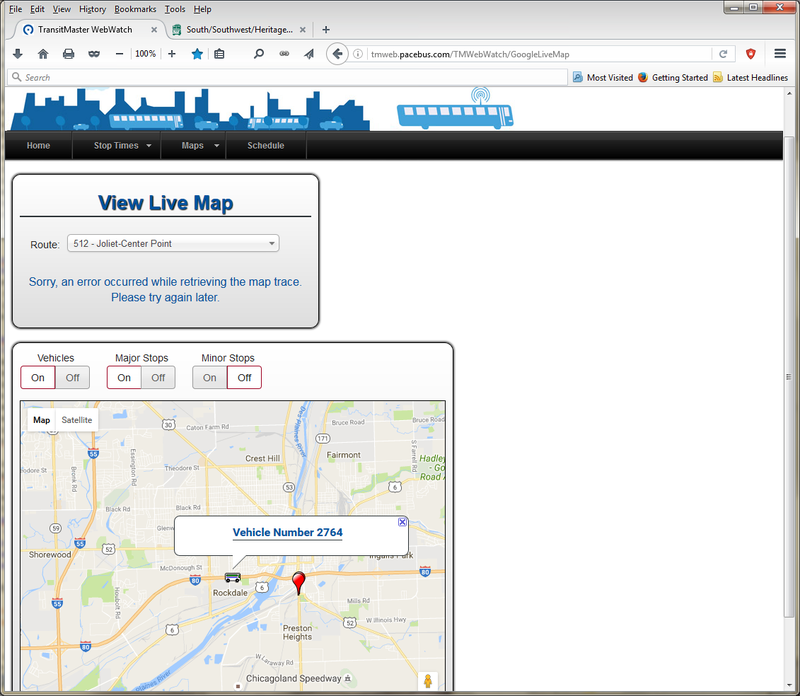 Webwatch now has 511 and 512 on the pulldown. 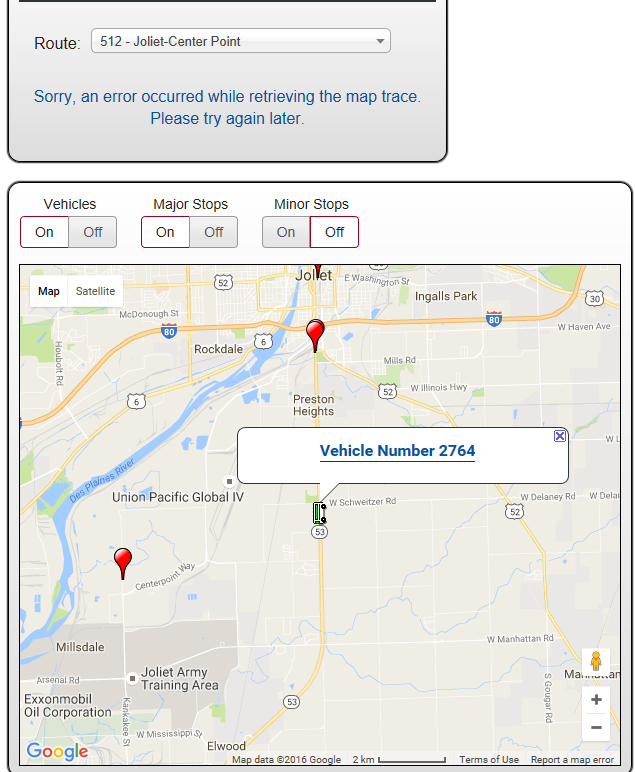 We'll have to see if a vehicle actually shows up. The map trace doesn't seem to be working for 512, and the routing for 511 shown on the map hasn't been updated for a few years. That's not a community vehicle, so we'll also have to see what, if anything, shows on 511. 2764 was pulled over on the side of the road for several minutes, and just pulled in to the Army Range parking lot. 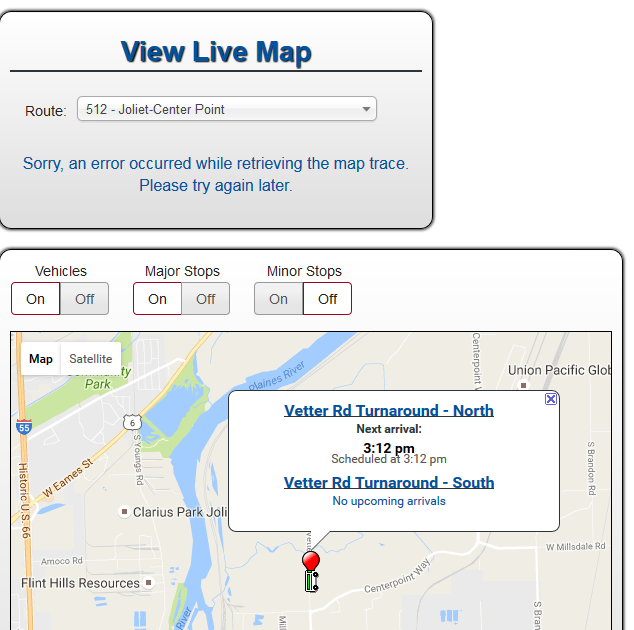 It is supposed to be at Vetter Rd turnaround right now (3:12 PM). I wonder what's going on. 3:28 PM - Headed toward I-55, possibly returning to downtown/garage. Maybe the supervisor already drove the route, since more than 1 or 2 passengers on the 2nd day of this route is very unlikely. 3:35 PM - On I-55 headed north. 3:45 PM - tracker shows nothing for the 3:40 westbound 507 from downtown Joliet. I'm betting that trip is now interlined with 512, because previously it was a pullout. That's what I was trying to say. 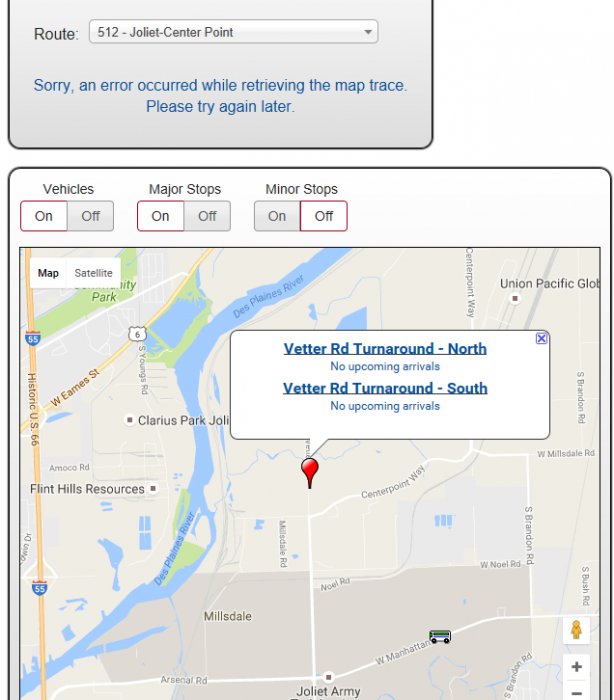 There is not a bus showing up on 507 when there should be. I think 2764 is supposed to interline from 512 to 507, but is delayed. Edit 3:57 PM - It's going the right way. We'll know in about 2 minutes. Confirmed. 2764 on 507, running 20 minutes late. Yes, it just flipped to 507. However, there doesn't seem to be an explanation why it followed the route it did, including bypassing the posted stop at Doris. I have the feeling it must have been some other special, not 512. Maybe a 3:35 becomes a 3:43, but something was messed up. The routing made sense as a deadhead from the garage to the Vetter Road turnaround. Note there are shorter ways, such as Laraway Road, but many roads in that area are closed for construction. Stopping on Manhattan Road, and then pulling in to the army lot is what didn't make sense. Then when it headed for the interstate, it bypassed almost the entire route, not just the stop at Doris. The thing with the interline I thought was strange is that if 512 really stops at Washington/Scott, it would then have to drive around the block to reach the stop for 507. So it only has 5 minutes to unload passengers, drive in a circle, and reload. 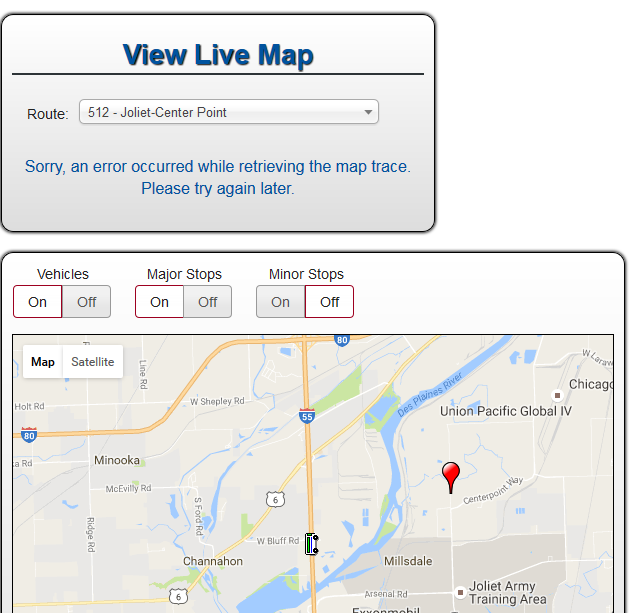 It seems more likely the evening trip drops off at Jefferson/Chicago to avoid that hassle. Otherwise, a major OTP issue would surely develop. What do you mean by "some other special" and why would it appear on the tracker as 512? 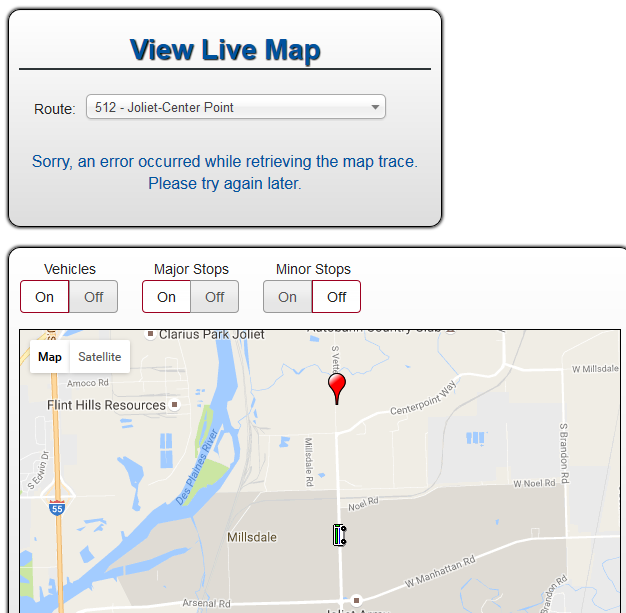 4:14 PM - 511 should have departed 3 minutes ago, but is not showing on the tracker. Probably it is using the same community vehicle as before. While I was watching it around 3:55, it clearly circled the courthouse and stopped in front of it. It did not go by the Union Station stop. On the rest, I don't know, but all the discrepancies made me think it was not the 512 on the schedule, and that maybe they use that route number also to indicate something else that actually served the JATC. I also noted that at that time, the stops at Doris and Scott said no arrivals scheduled. On 507, it says arrival at Jefferson Chicago at 4:45, scheduled at 4:34. On the rest, I don't know, but all the discrepancies made me think it was not the 512 on the schedule, and that maybe they use that route number also to indicate something else that actually served the JATC. I also noted that at that time, the stops at Doris and Scott said no arrivals scheduled. 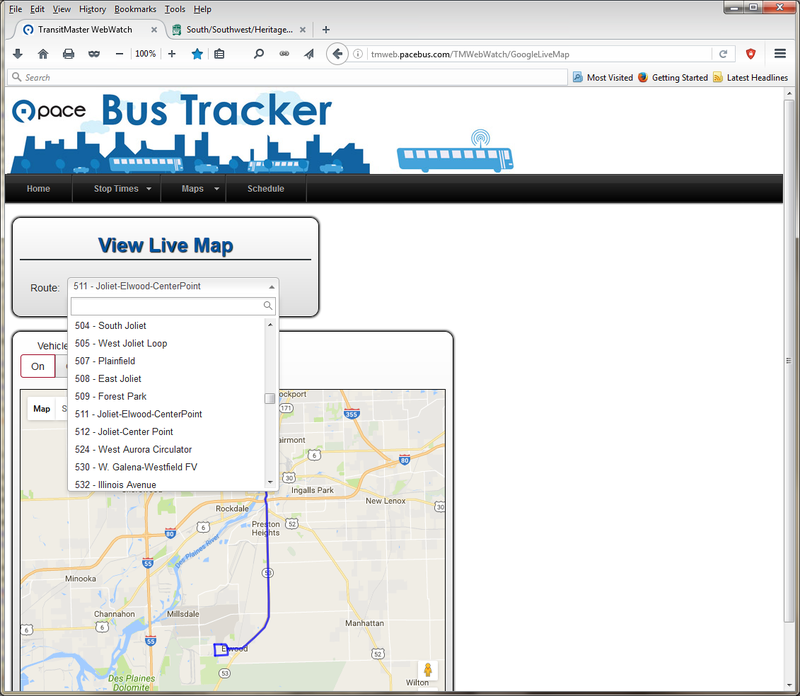 If there were a route serving JATC, wouldn't there at least be some mention of it on the Pace website, especially because it is using a regular bus rather than a paratransit/community vehicle? Since I observed the bus stopped on Arsenal Road (not a very safe place to pull over) for several minutes before it moved into the lot, I'm guessing there was some mechanical problem with the bus. 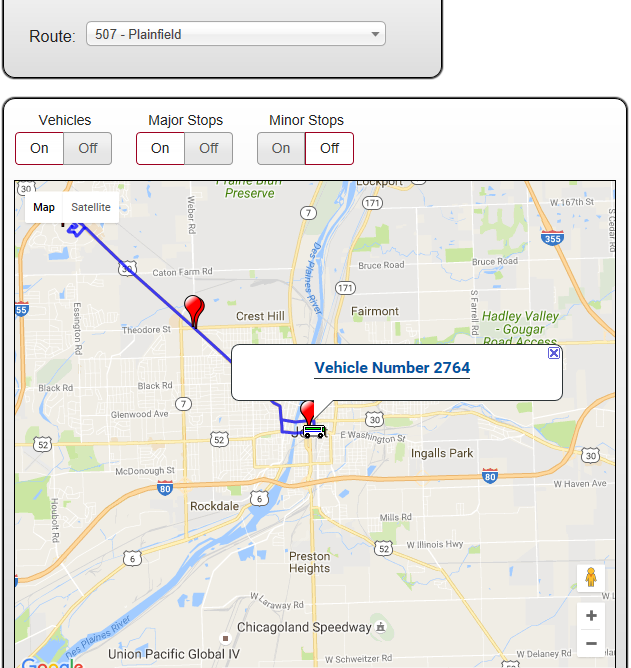 When a bus goes drastically off route, the tracker reverts to the scheduled times because the estimated times are based on the GPS location of the bus, so the bus must be on or reasonably close to the route for it to work right. In this case, the bus was miles away, and was also very late. That's why the tracker said "no arrivals scheduled". Another thought I had after rereading my prior posts is that 504 is on a detour because of a closure on Laraway Rd. That detour would also affect 511 and 512, but there is no passenger notice for those routes. I saw that too, but obviously something unusual was going on, so I'm not sure where it would stop if someone actually wanted to get off there. For the morning trip on 512, my bet is that it becomes an 834 after deadheading back from Vetter Rd. 2744 was on 512 this morning. I didn't look early enough to see it on the actual route, but I saw it deadhead back. As I had guessed, it interlined with 834. The deadhead routing was exactly the same as the regular route, including the section of Laraway that is supposed to be closed. If the road is open, that explains why there is no detour notice, but also makes less sense of the bus that went to Arsenal Rd yesterday. 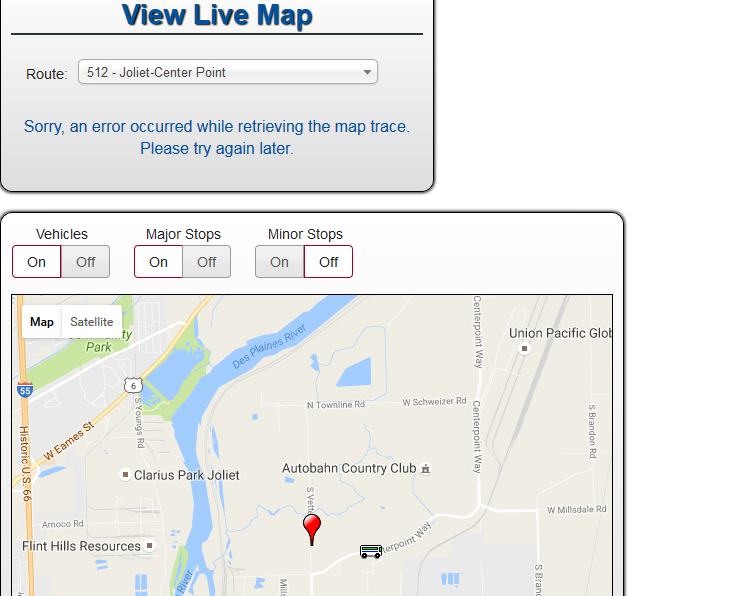 I also checked bus tracker for 504 at about 4:35 last night and saw it was still detouring. Maybe the road is closed intermittently? Another thought is that it wouldn't take much to make 512 a bidirectional route like 511. They'd just need the afternoon trip to loop around downtown before going south. I don't know if there is any demand for that, but I previously noted 511 often has a few riders going southbound in the PM, if that's any indication. 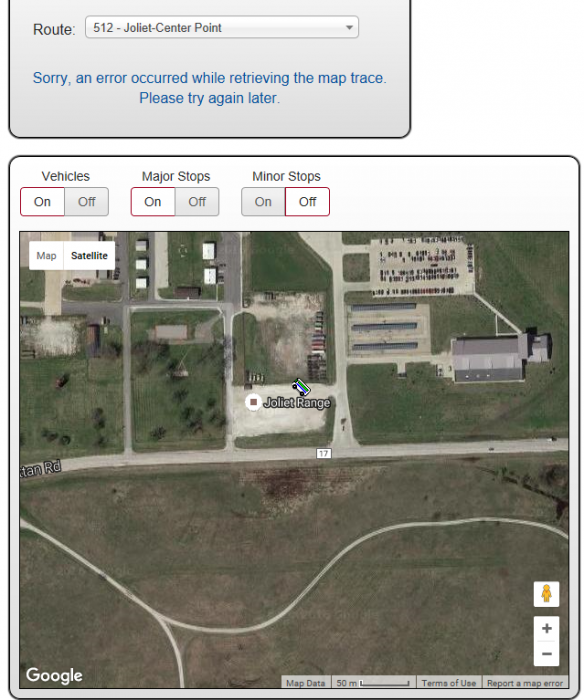 Well, we have 2749 on the 512 map going down to Manhattan Road again. 3:04, went north on Elwood industrial road and now seems headed in the right direction. In short, maybe Manhattan Road was the detour for Laraway Road westbound, but I don't know what else happened yesterday. Thanks for the report. I tuned in just in time to see bus circle the courthouse to reach the 507 stop, bypassing the stop on Scott. I hadn't thought of Laraway being closed westbound only, but that would mean 504 should have resumed its normal routing eastbound on Laraway. I'll try to remember tomorrow morning to check Webwatch earlier to see which way the bus goes. I'll try to remember tomorrow morning to check Webwatch earlier to see which way the bus goes. That won't do you any good, for obvious reasons (holiday schedule). Oops, I guess I can sleep in tomorrow! Actually I'll be in that area next week so I can check things out if there are still any unanswered questions by then. 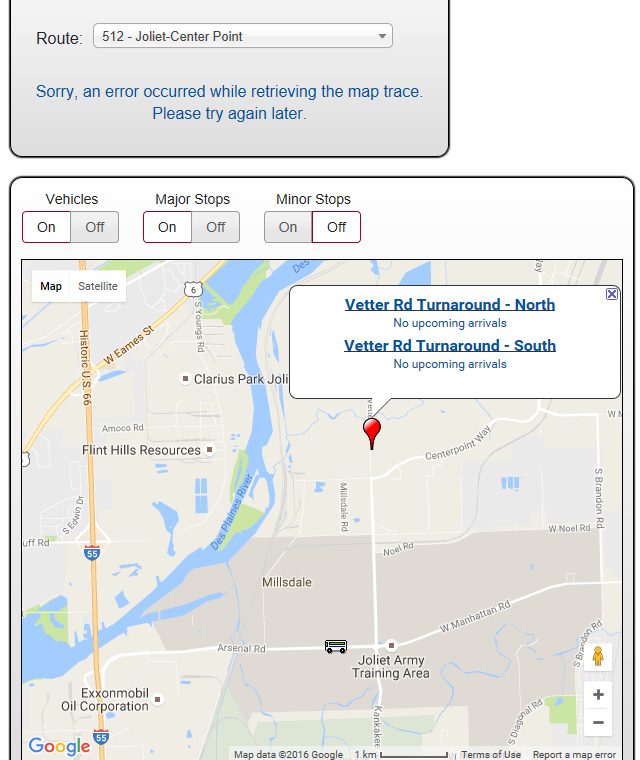 This is the Vetter Road turnaround. The Mars warehouse (background) isn't even open yet but they're already running buses to it. Not surprisingly, I saw 2743 with nobody on it. The destination signs were turned off. Also, 512 has not been added to any bus stop signs other than the one pictured. They did add the map trace on Webwatch for 512 sometime this afternoon. Laraway Road is open in both directions so I don't know what the deal is with the 504 detour and long deadhead on PM 512. 511 has the same community vehicle, 14401. Here it is on the 4:11 PM southbound trip with one passenger on board. 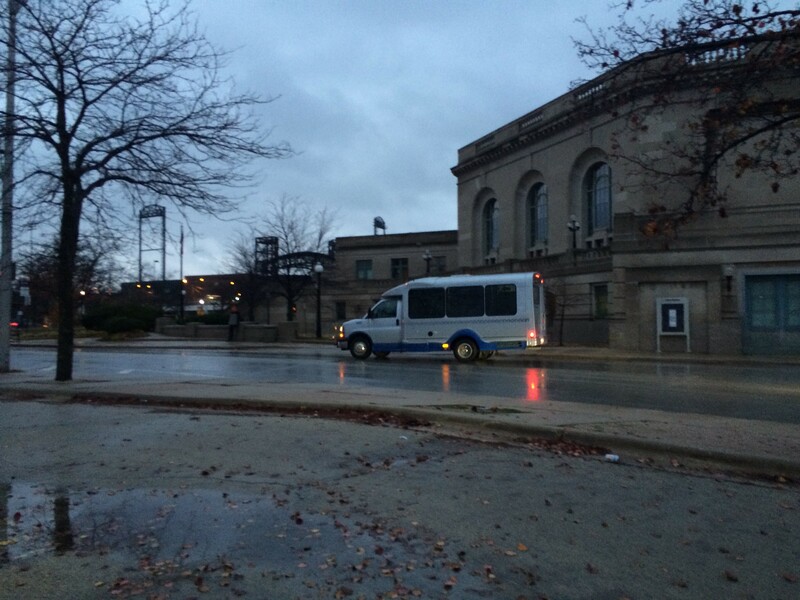 The Mars warehouse (background) isn't even open yet but they're already running buses to it. Not surprisingly, I saw 2743 with nobody on it. 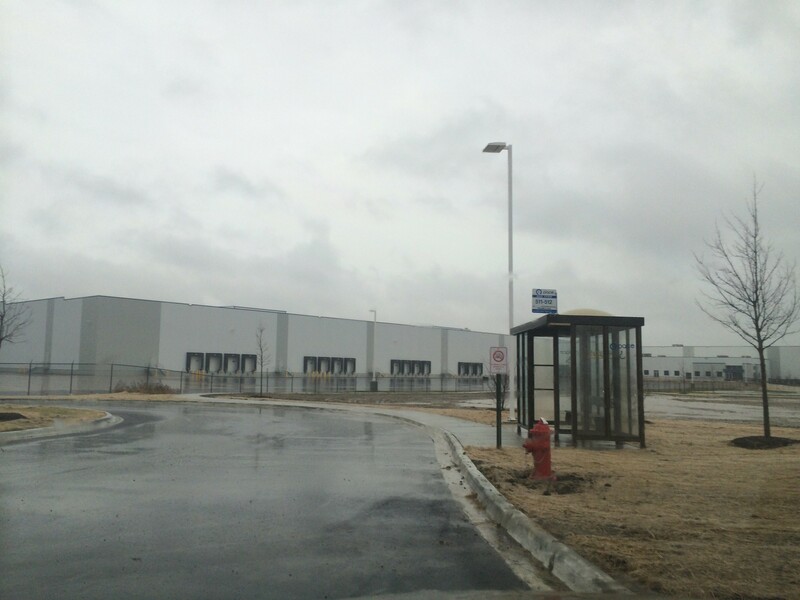 Two imponderables: If the warehouse isn't open yet, why they started the route now, and if nobody is riding the bus, why they are using a 30 foot bus instead of a community vehicle (and running the risk of messing up 507). Only thing that seems to make sense is that 512 isn't 511 because it uses a bus. News article saying that the warehouse is scheduled to open in 2017. That was stated a year ago, but the building looks nearly complete so that's probably still accurate. With that in mind, I agree it makes no sense to start the 512 route now. Pace has to make route changes when picks occur, but there will certainly be another pick before the warehouse opens. On the issue of why they are using a 30 foot bus, I'm sure it has to do with vehicle and driver availability. They were able to attach 512 to the beginning of existing runs (834 in the AM, 507 in the PM). I don't know what the projected ridership for 512 is, but I bet it's higher than 511. The vehicle assignments will make sense when people actually start riding them. 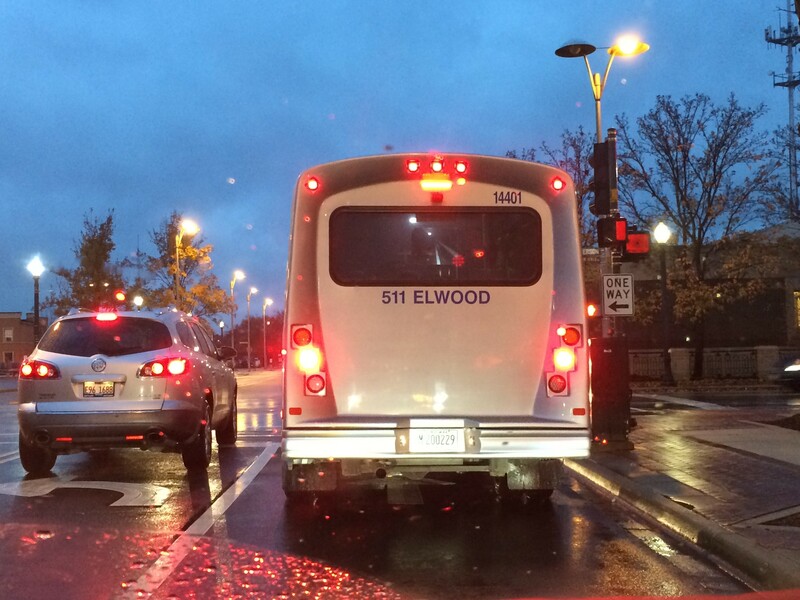 Also, 512 has not been added to any bus stop signs other than the one pictured. Correction to the above. Along northbound Route 53 there are 3 signs with "504-511-512", but also 2 with "504-511" and 1 with just 504. So a third imponderable is why replace some bus stop signs but not others. 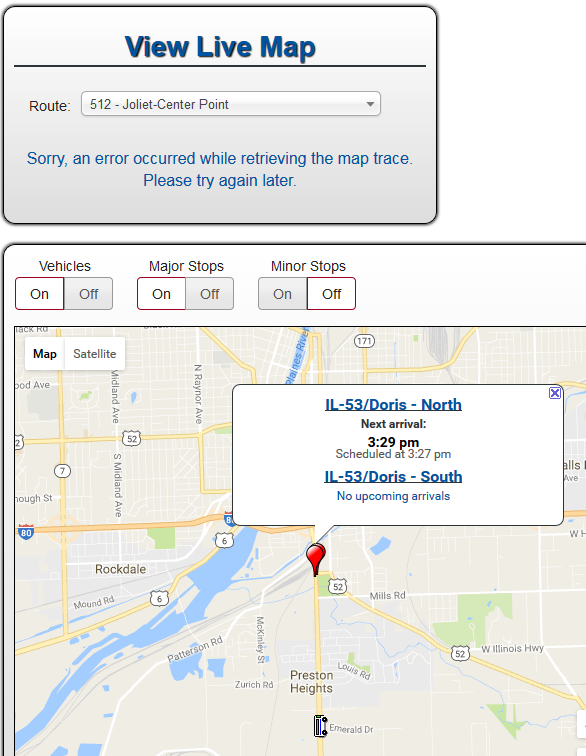 At IL 53/Doris (timepoint on the schedule), there are no bus stop signs, nor is there really a safe place to put one. Almost seems better to use IL 53/Laraway as the timepoint. This seems bass ackward, as Doris is a scheduled timepoint but not fit for a stop, and there are several stops that are not scheduled timepoints. 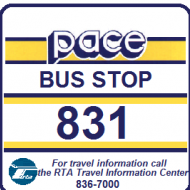 Again, like starting up 856, I'm surprised that Pace has departed from its former practice of publicizing new routes, or establishing industrial feeders without making sure the employer was supplying passengers (unless there was some JARC grant that just had to be burned).